Iran’s release of the U.S. sailors vindicates President Obama’s foreign policy approach. The quick release of the U.S. sailors by Iran shows the value of the president’s calm, even-keeled approach to foreign policy. 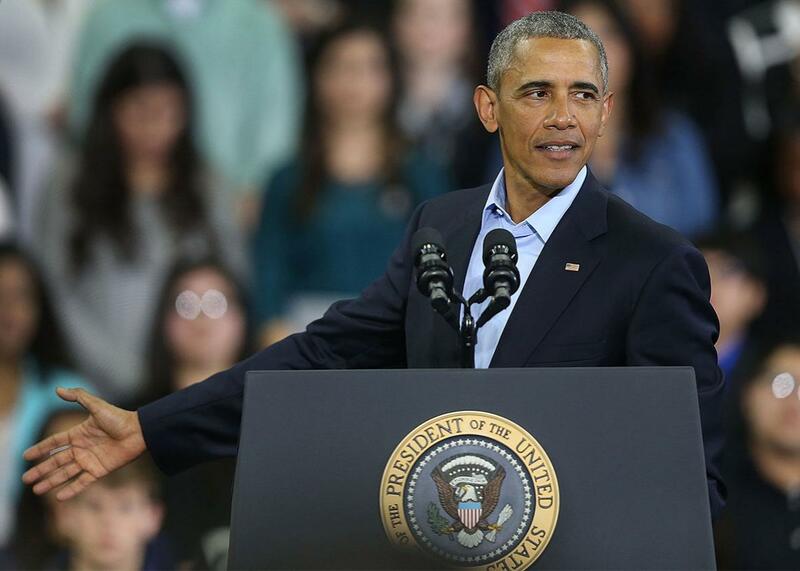 President Barack Obama, Jan. 13, 2016, in Omaha, Nebraska. The tempest in a teapot over Iran’s seizure of two American patrol boats on Tuesday, followed by their uneventful release on Wednesday, offers well-timed vindication of President Obama’s broad views on foreign policy and a harsh slap to the views of every Republican vying to replace him. As news spread of the boats’ seizure and the arrest of 10 American sailors on a routine patrol from Kuwait to Bahrain, the GOP candidates jumped into action. “Obama’s humiliatingly weak Iran policy is exposed again,” tweeted Jeb Bush. On Fox News, Sen. Marco Rubio called Iran’s move “absolutely” provocative. “Iran is testing the boundaries of this administration’s resolve,” he said, “and they know that … the administration is willing to let them get away with many things.” They have accelerated these tests since the nuclear deal, he added, which is why he’d repeal it on his first day in the Oval Office. Donald Trump fumed on Twitter, “Iran toys with U.S. days before we pay them, ridiculously, billions of dollars,” referring to the sanctions relief that will follow the dismantling of its nuclear infrastructure. “Don’t release money. We want our hostages back NOW!” Sen. Ted Cruz found it “striking” that Obama didn’t even mention the detained sailors in his State of the Union address Tuesday night. In the first 12 hours after the incident, none of the GOP candidates said anything like, “I think we should defer comment until all the facts are in,” a statement they could have made with commandingly furrowed brows. Instead, their motto seemed to be, “Shoot (or at least foment a crisis) first—ask questions later.” Or maybe don’t ask questions at all. Congressional Republicans vowed to bring up resolutions, the very next day, to impose new sanctions on Iran and to delay the release of frozen assets. Meanwhile, well before Obama entered the House chamber at 9 p.m. to deliver his final ceremonial address to Congress, Secretary of State John Kerry had spoken by phone five times with Iranian foreign minister Mohammad Javad Zarif. It had been established that the two American boats had crossed into Iranian waters, very close to Farsi Island, a military site. The sailors were being fed and supplied with blankets. The violation was seen as an accident, and arrangements were in place for the release of the sailors and the boats at sunrise—which took place without a hitch. By contrast, in 2007, Iran seized a British ship with 15 Royal Navy personnel onboard—and, because the two countries had no diplomatic contact, it took 13 days to negotiate their release. In other words, the diplomatic ties set in motion by the Iran nuclear deal may well have allowed this week’s incident to be resolved in less than one day instead of close to two weeks. So Tuesday’s incident represented no crisis, no humiliation, no test of Obama’s resolve, no sign of his weakness, and—in retrospect—no need to clutter what Obama saw as a lofty speech about the past and the future with transient blips that would be forgotten in a week. Certainly the GOP candidates have forgotten the blips—and hope that the voters do, too. Not one of them has back-pedaled in the slightest from the storm and stress they incited in the heat of crisis—the sort of crisis that they would be called on to meet, and soberly deal with, 100 times or more in the course of their presidency, a test that they failed miserably this week.